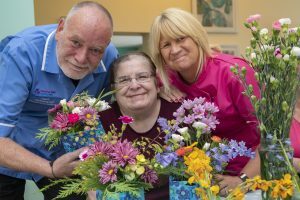 Royal flower power at care homes | News by Wales Express News, People Before Profit! A flower arranger who decorated Westminster Abbey for the wedding of Prince William and Kate Middleton has been helping care home residents make flower baskets fit for a future queen. Wendy Davis was one of five members of the floral committee at Llangollen International Music Eisteddfod who popped in to dispense top tips at the Pendine Park care organisation. The committee’s spectacular floral display in front of the pavilion stage in Llangollen is one of the colourful highlights of the annual festival of music and dance. Pendine Park is one of the event’s long-term supporters and has joined forces with Sir Bryn Terfel to sponsor the International Voice of the Future via the Pendine Arts and Community Trust. 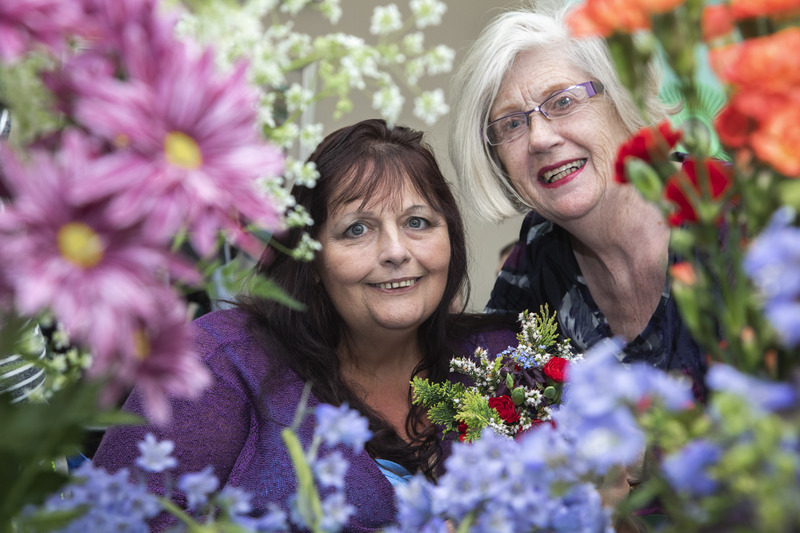 Pendine Park residents enjoy an afternoon of flower arranging with eisteddfod floral community members; Pictured is Gaynor Jones with Wendy Davis from the floral community. As part of the arrangement, Wendy and her fellow floral arrangers held a masterclass with the residents of four of Pendine’s care homes – Penybryn, Cae Bryn, Highfield and Bryn Bella. Wendy, a retired mechanical engineer and Wrexham CID administration officer, is one of the UK’s most talented flower arrangers and a former chair of the National Association of Flower Arrangement Societies. In that role she helped decorate Westminster Abbey for the royal wedding and a host of other royal occasion. Earlier this year she represented Wales at a floral arts judges’ seminar in Hydrabad, in India. According to Wendy, she had a blooming marvellous time helping the Pendine Park make flower arrangements for their rooms. She said: “I’ve been a member of the Llangollen International Eisteddfod’s floral committee for 25 years and we have a busy time ahead of us preparing for the eisteddfod. “I always enjoy coming to Pendine Park as my own sister, Alma Hughes, was so well cared for when she was a resident here. 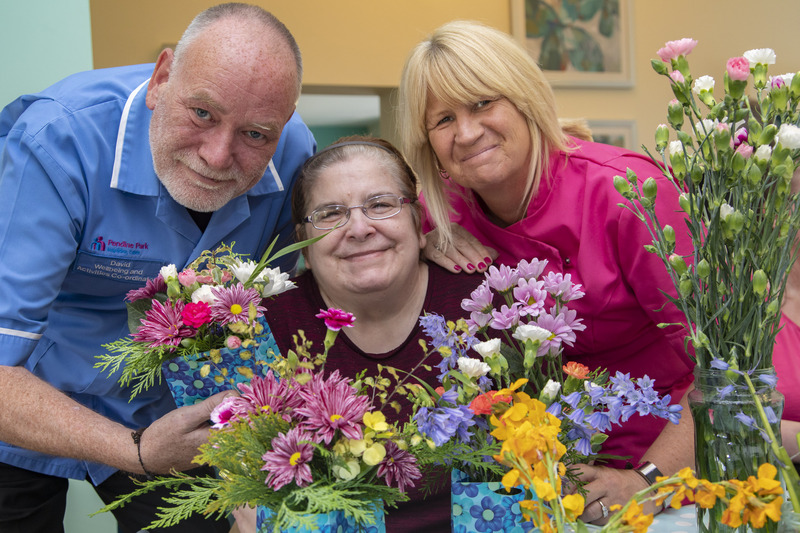 Pendine Park residents enjoy an afternoon of flower arranging with eisteddfod floral community members; Pictured is resident Tracey Wilde with Pendine care practitioners David Frost and Nicky Clarke. Floral committee chair Jane Williams agreed that the residents’ skills blossomed. She said: “I think residents enjoyed the smell, feel and colour of the flowers we have used. We have made individual flower bags that they can keep and take to their rooms. Pendine Park artist in residence Sarah Edwards, says the flower arranging activity was arranged as part of their enrichment programme. She said: “The idea is to encourage residents to feel empowered and to join in group activities and socialise with other residents. It’s a great way for new friendships to begin. Highfield House resident Marion Randele , 90, said the floral arrangement she had made would be taking pride of place in her room. Marion, who used to work as a motor vehicle insurance clerk, said: “I have settled in really well at Highfield House Care Home and enjoy it. Penybryn resident, Emma Barker, 42, originally of Lixwm, Flintshire, also had a ball. Bryn Bella resident, Christine Jones, 73, says was also thrilled with the flower bag she had created. Snowdonia Triathlon Festival 2016 – Legends are Made.